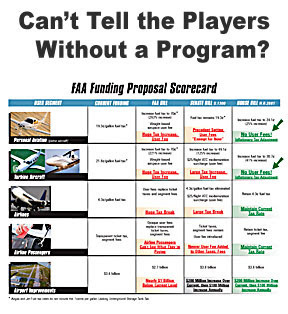 As promised, I am presenting more great info here verbatim from AOPA, who is invaluable in our fight against Bush's user fee scheme. And if it has all been pretty confusing up until now, this will clarify everything. Click the image above to download a PDF to print out and show all your flying buddies...THIS IS MANDATORY! The fight against general aviation user fees is far from over, and the outcome far from certain. With the September 30 deadline for Congress to pass a new FAA funding bill fast approaching, here's where we stand today. We now have one bill in the House of Representatives — H.R.2881, the FAA Reauthorization Act of 2007 — that, if it makes it all the way through to the president, would pay for air traffic control modernization (NextGen), would continue a robust airport aid program, and continue an efficient tax system that fairly distributes FAA funding costs among all aviation users. And it has no user fees. The members of the House Transportation and Infrastructure Committee listened to the evidence presented by AOPA, the Congressional Budget Office, and the Department of Transportation's inspector general and concluded that the current aviation excise tax system can easily generate the revenue necessary to run the FAA and build NextGen. They kept taxes the same on the airlines and proposed a modest tax increase for GA.
AOPA supports H.R.2881. When the right time comes, we'll be asking you to tell your senators and representative that you want H.R.2881. But there is a competing bill in the Senate. That bill (S.1300) includes user fees, and two powerful senators — John D. Rockefeller (D-W.V.) and Trent Lott (R-Miss.) — are pushing it. Sen. Rockefeller wants a GA user fee so badly that he has threatened to make sure that "all commercial airlines will get priority for landing" at the busiest airports if he doesn't get the user fee. Sen. Lott says it's S.1300 or "no bill." While there are no guarantees, H.R.2881 is likely to move through the House of Representatives without major changes, particularly if pilot support for H.R.2881 remains strong. Transportation Committee Chairman James Oberstar (D-Minn.) and aviation subcommittee Chairman Jerry Costello (D-Ill.) are adamantly opposed to user fees, as are most members of the committee. And there is very little support for GA user fees in the full House. In the Senate, however, there are strong advocates both for and against user fees. It is impossible to predict if the user fee section will survive to a final vote, but Sens. Rockefeller and Lott have plenty of ways to persuade other senators to adopt their point of view, not the least of which is the ability to block any FAA funding bill from going to a vote if they don't like it. There is a third bill that the FAA drafted, and it's the most onerous of all — user fees and huge tax increases. It's also all but dead, since neither the House or the Senate has acted on it. With that overview, let's try to answer some of the questions we've been hearing from AOPA members. Are user fees in or out? As you can see from above, user fees are in the Senate bill, but they are not in the House bill, H.R.2881. Both bills will continue to move through their respective chambers and ultimately to votes in the full House and Senate. Then a conference committee will work to resolve the differences between H.R.2881 and S.1300. That's why we have to keep letting Congress know that H.R.2881 is what general aviation pilots want. Why not make business jets pay a user fee? They can afford it. The Senate bill would impose a $25 per flight "air traffic control modernization surcharge" on all turbine-powered aircraft flying in "controlled airspace." Sen. Rockefeller points out that piston GA is exempt from that user fee under his bill, and that "$25 isn't exactly a back-breaker." AOPA's position is that a user fee for some will become a user fee for all. History backs us up on that. The hardest thing to do in politics is to impose a new tax or a new fee. After the tax or fee is in place, it is much easier to increase it and apply it to other groups. Ask the GA pilots in Australia and Canada. General aviation interests in both countries initially supported a change to a user fee system because they got a "good deal" and a "seat at the table." The deals are not so sweet now, and GA is in decline in Canada and Australia because of new and increased charges. If a certain segment of aviation is using the system more, it should probably pay more. But the way to do it is through the fuel tax, which is exactly what H.R.2881 does for both piston- and turbine-powered aircraft. Aren't the certificate and registration fees in both bills user fees? Yes, but they are fees that are already in existence, and they are quite similar to the fees you pay to register your car or boat. Both bills just make adjustments in the amounts. Government and tax experts are nearly unanimous in that a fee for issuing a certificate or registering a vehicle is an appropriate and efficient way to raise revenue. A user fee for flying in the National Airspace System (or driving down a highway for that matter) doesn't come so close to passing the appropriate and efficient tests. How would each of these bills affect me? Assuming that you are our typical member flying a single-engine piston, H.R.2881 would increase your flying costs slightly because it would increase the avgas tax by 4.8 cents per gallon. That essentially covers the rate of inflation since the last tax increase, and it's an amount that AOPA thinks is worth paying to help modernize air traffic control and maintain a robust airport aid program. S.1300 wouldn't change much for you now, but AOPA believes it would have a profound negative effect in the future. That's because we have no doubt that the $25 user fee will increase and will be applied to piston-engine aircraft as well. 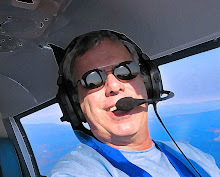 As we have seen in the rest of the world, user fees are the death of general aviation. What happens if Congress doesn't pass an FAA funding bill by September 30? In theory, the FAA would have to shut down. In practice, Congress would likely pass a temporary measure to keep the FAA's core safety-of-flight functions operating. Other services — medical certificate issuance, aircraft certification, etc. — could possibly be suspended. Airport funding grants would also likely be stopped. The government might also be forced to stop collecting aviation taxes. But don't expect the airlines to reduce the cost of ticket — they didn't in the past. Nor would the cost of avgas drop immediately. That's because the tax is actually collected at the refinery. 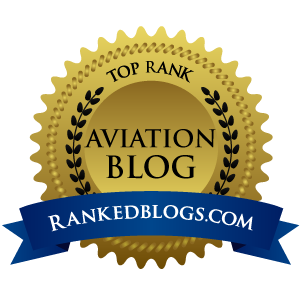 So it is important to keep the momentum behind H.R.2881 as the best bill for the future of all of aviation.